Nico Rosberg won the Monaco Grand Prix today in his Mercedes. Sebastian Vettel was second in his Red Bull-Renault, 3.8 seconds behind, and his team mate Mark Webber finished third, 6.3 seconds behind the winner. Rosberg wins exactly 30 years after his father Keke Rosberg won the Monaco GP. He is the first child of a former winner to take victory at the Principality. It is Rosberg's second career win - his first win coming last season in China. Lewis Hamilton (13.8s) finished in fourth place in his Mercedes GP, followed by Adrian Sutil (21.4s) in the Force India-Mercedes in fifth, Jenson Button (23.1s) in the McLaren-Mercedes in sixth, Fernando Alonso (26.7s) in the Ferrari was seventh, Jean-Eric Vergne (27.2s) in the Toro Rosso-Ferrari was eighth, Paul di Resta (27.6s) in the second Force India was ninth and Kimi Raikkonen (36.5s) in the Lotus-Renault finished in the final points paying position in tenth. Vettel extends his lead in the drivers champion with 107 points over Raikkonen (86), Alonso (78), Hamilton (62), Webber (57) and Rosberg (47). In the constructors' championship Red Bull-Renault leads with 164 points over Ferrari (123), Lotus-Renault (112), Mercedes (109), Force India-Mercedes (44) and McLaren-Mercedes (37). Before the start the most teams will be trying to have a one-stop race, while Mercedes GP will likely make two stops. Red Bull is expected to try for one-stop, but will be marginal on the super soft tyres. The top ten will start on super-soft tyres. Only Grosjean, Gutierrez, Ricciardo and Massa starting on the soft tyre. On the rolloff, Bianchi is pushed off the grid and will attempt to start from the pit lane. At the start, polesitter Rosberg takes the lead from Hamilton, Vettel, Webber, Raikkonen and Alonso. At the hairpin Sutil and Perez make contact, but continue. Maldonado pits for a new front wing, Van der Garde pits as well after running into Maldonado. On lap 2 Rosberg has a 1.1 second lead on Hamilton, who is holding up Vettel. Alonso is looking for a way past Raikkonen. Button complains on the radio that his team mate Perez is cutting the chicane. On lap 4 Maldonado sets fastest lap at 1m21.3s. On lap 6 Perez and Button battle over seventh place. Perez cuts the chicanes to stay ahead. Alonso has dropped 1.9 seconds behind Raikkonen in fifth place. Rosberg is told to look after his tyres. On lap 9 Charles Pic pulls his Caterham to the side of the track at the pit entry - the car catching fire. Button gets past his team mate Perez for seventh - after Perez is instructed to give way after cutting the chicane several times. At lap 10 Rosberg leads his team mate Hamilton by 1.5 seconds, ahead of Vettel (3.7s), Webber (4.4s), Raikkonen (5.5s), Alonso (9.0s), Button (9.8s), Perez (10.3s), Sutil (11.0s) and Vergne (11.9s) in tenth place. Massa (18.5s) runs in 16th place. On lap 10 Di Resta pits for soft tyres, and then promptly sets fastest lap at 1m20.558s, and then again at 1m20.2s. On lap 11 Pic's car is pushed into the pits. On lap 17 a line of cars is building behind Alonso in sixth place. At lap 20 Rosberg continues to lead his team mate Hamilton by 2.0 seconds, followed by Vettel (4.2s), Webber (5.5s), Raikkonen (6.4s), Alonso (9.7s), Button (10.9s), Perez (11.6s), Sutil (12.2s) and Vergne (13.8s) in tenth place - Grosjean runs 14th and Massa in 16th. Mercedes radios Rosberg to pick up his pace. On lap 23 Ricciardo and Bianchi both pit. Chilton pits on the next lap. On lap 24 Webber sets fastest lap at 1m19.3s. Mercedes tells it's drivers to pick up the pace another half second quicker. On lap 25 Webber pits from fourth. Vettel sets fastest lap at 1m19.7s. Di Resta passes Massa for 16th at the first corner. On lap 26 Raikkonen pits from fourth, while Button pits as well. Massa also pits. Ricciardo sets fastest lap at 1m19.4s. On lap 27 Hulkenberg pits his Sauber. Rosberg has a 2.6 second lead over Hamilton - 4.5 seconds over Vettel in third. On lap 28 Alonso pits from fourth, and rejoins just behind Raikkonen. Webber set fastest lap aty 1m19.1s. Gutierrez pits as well. On lap 28 Massa crashes in Ste Devote - almost a copy of his crash on Saturday. Perez and Vergne pit. Yellow flags wave. On lap 29 Hamilton sets fastest lap at 1m19.1s. On lap 30 Vettel pits from third, Sutil pits as well. The safety car is deployed. Bottas and Grosjean pit. Massa is out of the car sitting at the side of the track, looking as if his neck is sore. Rosberg and Hamilton both pit for soft tyres. Rosberg comes out in the lead, while the two Red Bull's get past Hamilton as he rejoins the track. On lap 32, under the safety car period, Rosberg leads Vettel, Webber, Hamilton, Raikkonen, Alonso, Button, Perez, Sutil, Vergne in tenth, Di Resta, Hulkenberg, Ricciardo, Grosjean, Bottas, Chilton, Gutierrez, Maldonado, Bianchi and Van der Garde in 20th position. On lap 36, Bianchi and Van der Garde pit for fresh soft tyres. Massa's Ferrari is removed from the track. The medical car takes Massa to be checked out. At the end of lap 38 the safety car dives into the pits and the race resumes. Rosberg gets a good restart and pulls away from Vettel. Hamilton closes on Webber. Raikkonen defends against Alonso. 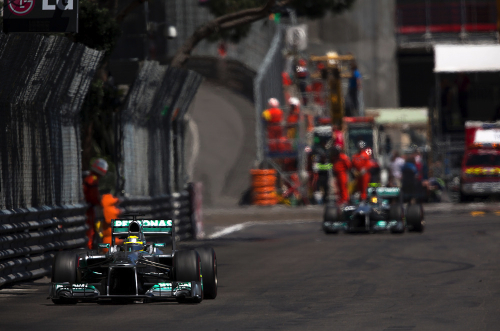 On lap 40 Hamilton gets side-by-side with Webber at Rascasse, but can't get by the Red Bull. On lap 42 Alonso tries to get on the outside of Raikkonen. Button and Alonso touch tyres. Out of the tunnel Perez makes a move and passes Button at the chicane. Alonso continues to hound Raikkonen for fifth place. On lap 44 Perez tries to pass Alonso down the inside into the Nouvelle chicane. Alonso cuts the chicane to avoid the two coming together. On lap 45 Chilton and Maldonado make contact near the swimming pool, and Maldonado's car jumps up in the air, hitting the barriers and pulling the Techpro soft barriers out onto the track. Maldonado is okay and gets out of his Williams. Chilton limps back to the pits with damage. The red flag comes out and the drivers come back to the grid and the race is temporarily suspended with 52m38s (or 33 laps) to go in the race. The teams will be allowed to change tyres before the restart as a precaution. At the red flag, on lap 45, Rosberg runs ahead of Vettel, Webber, Hamilton, Raikkonen, Alonso, Perez, Button, Sutil, Vergne in tenth, Di Resta, Hulkenberg, Ricciardo , Grosjean, Bottas, Gutierrez, Chilton, Van der Garde and Bianchi. The race will be restarted at 15:35 local time. There is much discussion going on during the red flag about Alonso giving up sixth position to Perez at the restart, after cutting the chicane earlier to stay ahead of the Mexican driver. The incident between Chilton and Maldonado is under investigation by the stewards of the race. The grid clears and the car are away behind the safety car. Alonso gives his position up to Perez on the formation lap. All the drivers except Raikkonen and Hulkenberg start of super soft tyres. The safety car is in and the race resumes on lap 48. On lap 49 Alonso is hounding Perez - looking to take back sixth place. Chilton pits to take a drive-through penalty for causing the accident with Maldonado. At lap 50 Rosberg leads Vettel by 1.4 seconds, followed by Webber (2.0s), Hamilton (2.2s), Raikkonen (3.0s), Perez (3.7s), Alonso (4.0s), Button (4.6s), Sutil (5.1s) and Vergne (6.2s) in tenth place. Hamilton is looking for a way past Webber in third. On lap 53 Sutil passes Button in the hairpin to take eighth place. Raikkonen and Perez battle into the Nouvelle chicane and both cut the corner. Rosberg pulls out a 2.0 seconds lead on Vettel. On lap 55 Sutil attempts an outside pass of Alonso at the hairpin, but can't make the pass. On lap 57 Sutil tries at the hairpin again, and takes seventh place from Alonso. On lap 60 Bianchi slides down the escape road at Ste Devote and ends his day in the barriers. At lap 60, Rosberg leads Vettel by 4.1 seconds, followed by Webber (4.8s), Hamilton (5.5s), Raikkonen (6.2s), Perez (6.6s), Sutil (7.2s), Alonso (8.2s), Button (8.6s) and Vergne (9.4s) running in tenth place. On lap 63 out of the tunnel Grosjean runs into the back of Ricciardo - Ricciardo ends up down the escape road, Grosjean limps to the pits minus his front wing. The safety car is deployed once again due to the debris on the track. On lap 64 Gutierrez and Chilton pit for new tyres. Grosjean is back in the pits to look at his suspension. The team retires the Lotus. Lotus warns Raikkonen that his car is running hot under the safety car and that his is losing water in the radiators. A replay shows Rosberg narrowly missing hitting a pigeon in the chicane. At the end of lap 66 the safety car comes in and the race resumes, with Rosberg taking the lead once again. Hamilton radios his team that his left front tyre is suffering. On lap 69 Perez is pushing to find a way past Raikkonen. Perez tries to dive down the inside of Raikkonen - the two touch, with Perez brushing the barrier. Part of Perez's front wing breaks off but the two continue. On 71 Raikkonen pits for new tyres with a puncture from his incident with Perez. Button passes Alonso into Rascasse to take seventh place. Gutierrez sets fastest lap at 1m18.6s. On lap 73 Raikkonen sets fastest lap at 1m17.9s. On lap 74 Perez, struggling with part of his front wing missing, runs wide at the Nouvelle chicane. Perez runs wide and goes down the escape road at the final corner - his day is done. On lap 76 Rosberg leads Vettel by 4.6 seconds. Vettel posts the fastest lap at1.16.5s and closes the gap to 2.8 seconds with two laps remaining. Red Bull radios to Vettel after setting fast lap saying not to take any risks, that you get no extra points for fast lap - Vettel responds, "but satisfaction". On the final lap Raikkonen passes Hulkenberg to take tenth place, and one point. Rosberg wins, Vettel is second and Webber finishes third.